PCL-18B-2 (sold in sets of 2) Each post in this super-duty portable lift system has a 18,000-lb. capacity all on its own. When you put six of them together, they are capable of pushing an incredible 108,000-lbs. worth of metal to a serviceable height of 71-1/2”. The PCL‐18B Series proudly adds to BendPak’s distinctive history of building the best lifts money can buy with evolutionary steps in ergonomics, power, safety, durability and performance. 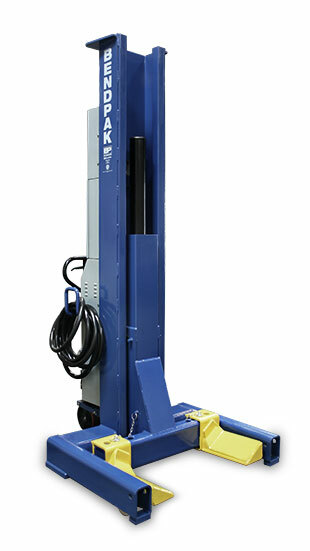 These portable column lifts designed exclusively for heavy‐duty fleet service are precisely suited for the toughest applications. Portable and surface mounted means no excavation or expensive site preparation. BendPak mobile column lifts provide the flexibility and convenience to lift vehicles ranging from light trucks to the largest two and three‐axle vehicles up to 108,000 pounds with varied axle or wheelbase lengths. They provide more of what you need on every job; limitless lift cycles to keep you working longer, more flexibility to work on a wide variety of vehicles with easier, safer operation and more features and productivity‐enhancing tools matched to your needs. The PCL‐18B Series defines professional level performance and quality from the super‐efficient three‐phase power system to a simplistic yet durable design that helps reduce scheduled service requirements and operating costs. Never before has a series of portable column lifts delivered so much power and versatility for both indoor and outdoor* applications. The PCL‐18B portable column lift systems feature a user‐friendly and revolutionary design that reduces operator fatigue meaning a mobile lift that’s easier to use and set up and much faster than competitive units. They allow your technicians to get vehicles in the air and back on the road faster and easier than ever before. Because the PCL‐18B uses an energy efficient on‐demand electric‐hydraulic power system it requires no constant recharging so it’s ready around the clock providing measurably longer work cycles than any other mobile column lift in its class. The PCL‐18B‐4 uses just three 30’ control cables (as opposed to four like other brands) so the front or back of the lift is always accessible and free of interconnecting cable obstruction. Save valuable time by driving vehicles in and out of the work area without disconnecting and reconnecting cables. Low‐pressure HVLP direct‐drive cylinders eliminate the need for lifting chains or expensive‐to-maintain screw‐drive systems. Inverted hydraulic cylinders mean the chrome piston rods are protected from debris and damage at all times which extends the service life and reduces maintenance costs substantially. Independent self‐contained electric‐hydraulic power units (one per column) are fast, smooth and reliable and include a motor, gear pump, reservoir, internal valving, a load hold check valve and pressure relief circuit in a reliable yet easily serviceable assembly. Six inch diameter Cush‐Ride™ front wheels feature an adjustable active leaf spring design that provides variable up‐front ground clearance for smooth traveling over uneven floors, deteriorating asphalt, expansion seams and thresholds. You set the front wheel ride‐height to whatever setting best suits your conditions. Turn the adjusting screw to the max setting and the front legs rise nearly three inches off the ground to facilitate roll‐on‐roll‐off loading of trailers and rollback trucks or to make easy passage of drainage gutters or floor irregularities. During operation, the front wheels automatically compress and settle down providing firm stable support of the lift column. Operator convenience is a key parameter in the design of the PCL‐18B. The PLC‐based control system is operated by means of intuitive push‐button controls for continuous synchronization of all columns. All operator instructions, symbols and warnings are printed in clear text and are easy to understand. The PCL‐18B Series allows you to operate, view and change operation parameters directly from each individual full‐control panel. Each column is equipped with an emergency shut off switch. If a system error is detected or if the life of a consumable part is nearly expired, fault codes indicators are instantly lighted. This allows the user and service coordinator to take appropriate action. If critical faults are detected, all operation functions will be disabled until the affected condition is corrected. A Direct Logic™ PLC (Programmable Logic Control) and other off‐the‐shelf components from top-tier hardware manufacturers control operation functions and column synchronization. Other lift systems may use dedicated proprietary printed circuit board specific to that brand which can be very expensive should replacement ever be needed ‐ if and when available. All control system hardware conforms to CE, CSA, ANSI, ASME, OSHA and UL regulations. At BendPak we make every effort to use USA-sourced components and engineering for our products. Product development, assembly, testing and packaging of all PCL-18B lifts is undertaken at our manufacturing facility in Santa Paula, California.  We’re more than just a lift company; we’re a dedicated and highly focused team of experts whose primary commitment is to provide our customers with the best possible after-the-sale service available. Our award-winning Certified Service™ program is how we keep those customers smiling long after the initial purchase of their garage equipment product. When the unexpected happens, BendPak Certified Service™ is your first and final step towards making it right. Even though our business starts with a quality, cost effective product, we understand that it is the support and services we provide after the sale that help keep your business running at peak efficiency. TEAM, PAIR OR SINGLE COLUMN OPERATION selects which lift columns will operate as group, tandem or individually. Single mode results in commands from specific lift columns; team and pair modes results in commands from any column designated in their respective group. UP CONTROL initiates the lift rise sequence. Automatic synchronization via auto‐level corrections is made through‐out all operations in addition to inadvertent loss of motion detection. DOWN CONTROL initiates the lift lowering sequence. If the lift is parked on the locks, the lift will first automatically rise slightly to clear the locks before descending. If the lift is not parked on the locks, the lift will descend immediately with no initial upward movement. During the lowering sequence, the lift will initially descend at a slowed (turtle) speed, and then automatically initiate to full (rabbit) speed after a short delay. Automatic synchronization via auto‐level corrections is made throughout all operations in addition to inadvertent loss of motion detection. ULTIMATE LEVEL ERROR makes sure that if for any reason the lift operation exceeds a specified out‐of‐level tolerance threshold, all lift columns will stop and display an out‐of-level tolerance error. To clear the error, an offending lift would be put in SINGLE mode and raised or lowered accordingly to reduce the difference in lift heights. PARK CONTROL initiates the lift locking (parking) sequence. Each lift column will slowly settle onto the mechanical stops. TWO SPEED OPERATION means parking and lowering speeds are controlled by you. When trying to settle a bus on tall jack stands go ahead and opt for the slower "turtle" speed for a safe controlled descent; when the job’s done and it’s time to remove the vehicle from the work area, select the faster "rabbit" speed for a rapid controlled descent. EMERGENCY STOP shut off switches on each column quickly shut off power to the lift in the event an unsafe condition is detected by the operator. Min column height: 97.5" / 2572 mm. Max lifting height: 71.5" / 1889 mm. Column weight: Ea. 1450 lbs. / 657 Kg.